66 year old, Geff, Illinois resident Thomas A. 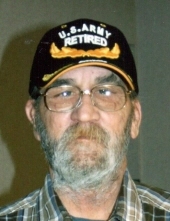 Brown passed away March 18, 2019 at Aperion Care in Fairfield, Illinois. . Tom went in to the Army at age 18 and proudly served his country for 20 years. Tom was born December 18, 1952 in Kirk, KY to Shirley Howard Brown and Mary Lucretia (Duncan) BrownHe married Mary Jane Robertson on December 4, 2009 in Kentucky and she survives. Tom is survived by his wife, Mary Jane; three sons, Jason Staton of Indianapolis, Indiana, Christopher Brown in Germany and Thomas Brown in Texas; one step son, Fred Paul of Corpus Christi, Texas; one step daughter, Tina Bailey of Cisne, Illinois; one sister, Joanna Cox and her husband David of Charlestown, Indiana; two sister-in-law's, Pat Legg and her husband Gerald and Lelah Garrison all of Sims, Illinois; two brother-in-law's, Billy Robertson and his wife Doris of Fairfield, Illinois and Harold Robertson and his wife Alene of Geff, Illinois; and three grandchildren. Tom was preceded in death by his parents and one step-son, Jimmy Joe Paul. A graveside service for Thomas A. Brown will be held at 12:30pm, Saturday, March 23, 2019 at Union Cemetery with Pastor George Musgrave officiating. Military rites will be provided by Anthony Wayne Post 176 American Legion and Wayne Memorial Post 4535 VFW. A visitation will be held from 10:00am until noon Saturday, March 23rd at Nale's Funeral Home in Fairfield. Memorials may be given to the VFW or the American Legion and will be accepted at the funeral home.